Designer Ralph Lauren at Western Wall Wearing Tefillin? Was it really him or his brother Lenny? 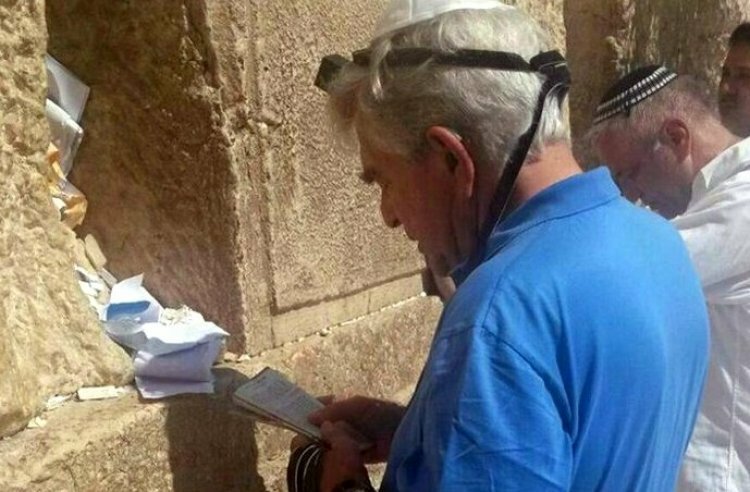 On Sunday, Ralph Lauren was seen at the Western Wall wearing Tefillin and praying. He was accompanied by a security guard and other friends. Some people claim it wasn’t Ralph Lauren himself; rather it was his brother Lenny. Lauren who is a leading world designer who even designed the dress first lady Melania Trump wore to the presidential inauguration. After praying at the Western Wall wearing tefillin, he placed a note in a crevice of the wall and then went on a tour of the Western Wall Tunnels where he met the assistant of Rabbi Moshe Sternbuch, one of the chief rabbis of the Edah Hacharedit. He asked the assistant to give his name in to the venerable rabbi in order to receive his blessing. Lauren stressed that it would be a great merit for him to get the rabbi’s blessing as in the states Rabbi Sternbuch is highly regarded as a grand sage of the generation whose blessings are fulfilled. No statement denying or confirming this visit came from Israel’s Ralph Lauren’s office as of yet.